Osram has added the OSLON Black Series to its successful OSLON family. The first member of the new series has a metal lead frame, a compact package and a tried and tested lens design. The LED can be used wherever there are large fluctuations in temperature and a large amount of light is needed from a small area. Like other OSLON LEDs, the OSLON Black Series has a lens with a 90° beam angle and produces a typical brightness of 115 lm at an operating current of 350 mA and a color temperature of 6500 K. The LED uses a 1 mm² chip and is available in all colors including warm white. As is usual with OSRAM, the OSLON Black Series solder pad is compatible with the other LEDs in the product family. The OSLON Black Series combines thermal stability with high performance and reliability in a compact black package. It is ideal for example for, trains, planes and automobiles, and even refrigerators. 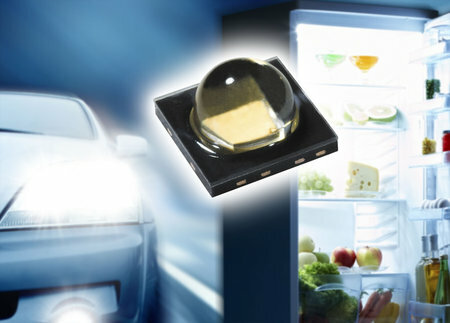 This LED really shows its strengths wherever high thermal stability, performance and brightness are needed.